Good foundations make things safer and longer lasting on the top. The cartoon approach adds humour to a serious subject. Poorly stacked piles of goods caused many injuries in warehouses and on the docks. 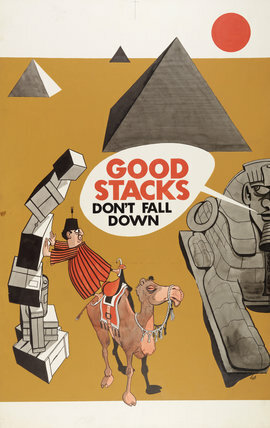 The awkwardness of the camel emphasises the randomness of the stack beside it.